SOLD – Alejo is a superb 2013 PRE black Andalusian colt. 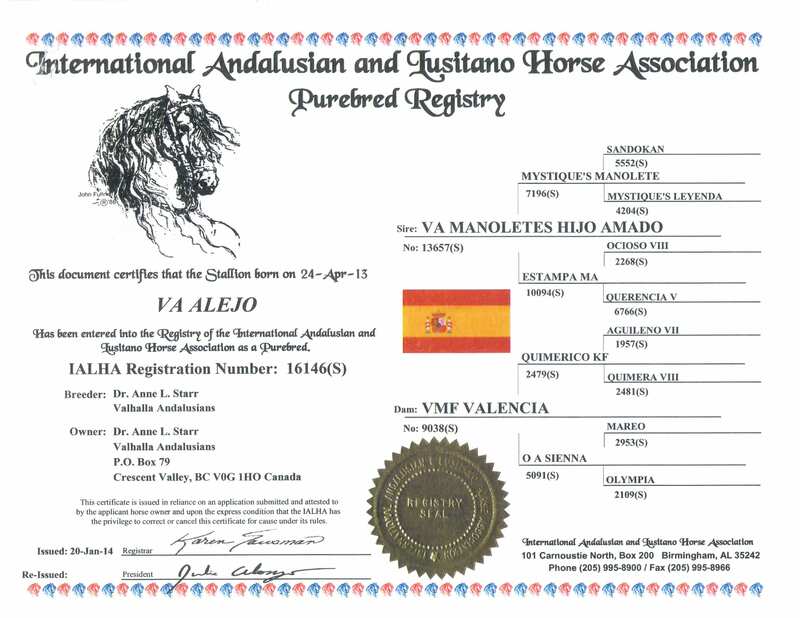 His dam is our Canadian national champion mare VMF Valencia and his sire is our US national champion stallion VA Manolete’s Hijo Amado. 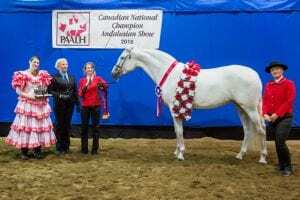 The combing of these two bloodlines to produce Alejo proved unbeatable at the 2013 Canadian National Show. Alejo’s sire line is flawless for both movement and morphology and his dam line is movement, movement, movement. 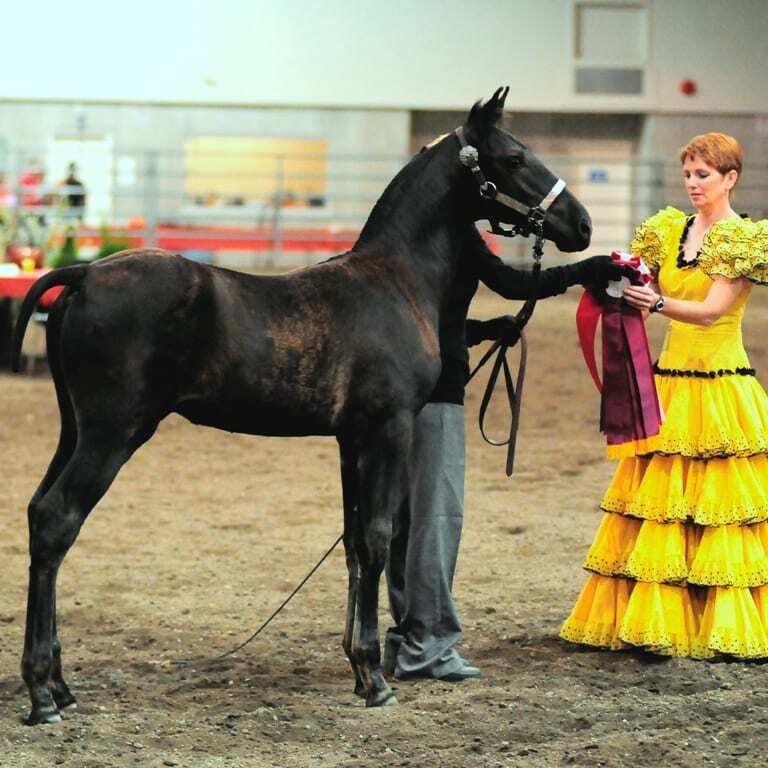 At 3 months old Alejo was shown and became the 2013 – National Champion Colt, 1 and under and Gold Medal movement winner, Champion PRE Stallion, All Ages, National Champion Stallions, All Ages, Amateur to Handle and the icing on the cake was being awarded the title of the 2013 Canadian Supreme Halter Champion, Purebred Andalusian. The Santa Barbara based Judge Sue Burkman said “This colt is gorgeous, I mean absolutely gorgeous”. These were very high accolades from such a highly respected judge. 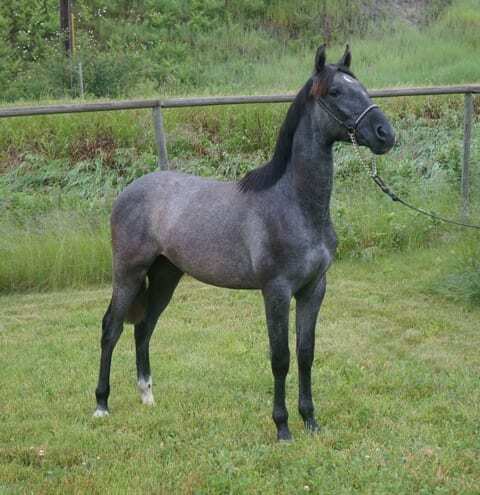 Duquesa is a stunning 2013 grey Andalusian filly. 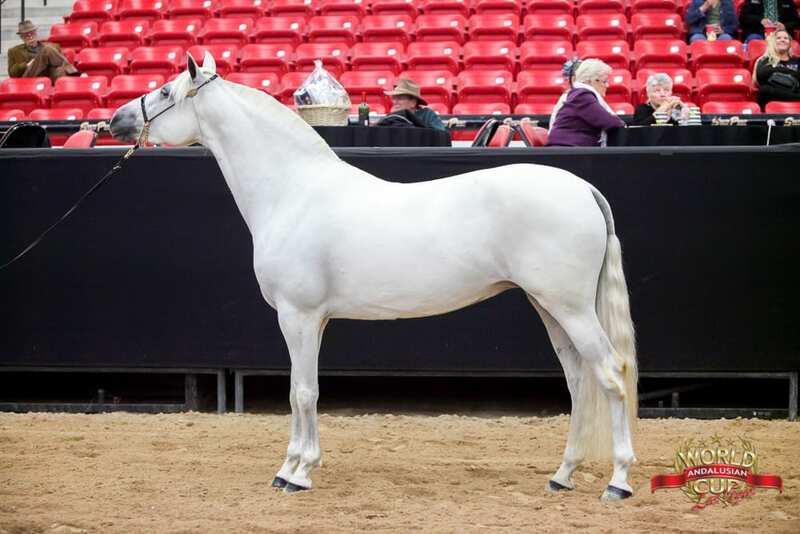 Her dam is our multi-national champion mare, Coqueta Elegante and her sire is Peregrino De Fraille, a gorgeous imported stallion from Spain and a US Regional Champion. Duquesa was born with white around her eyes and by the time she was 3 months old she was snow white. A very striking filly, Duquesa has incredible conformation and movement with a very feminine look. At the 2014 Nationals, Duquesa took everyone by surprise when she entered the arena and was a complete show stopper. She was so breathtaking that the photographer requested a private photo shoot after the show. 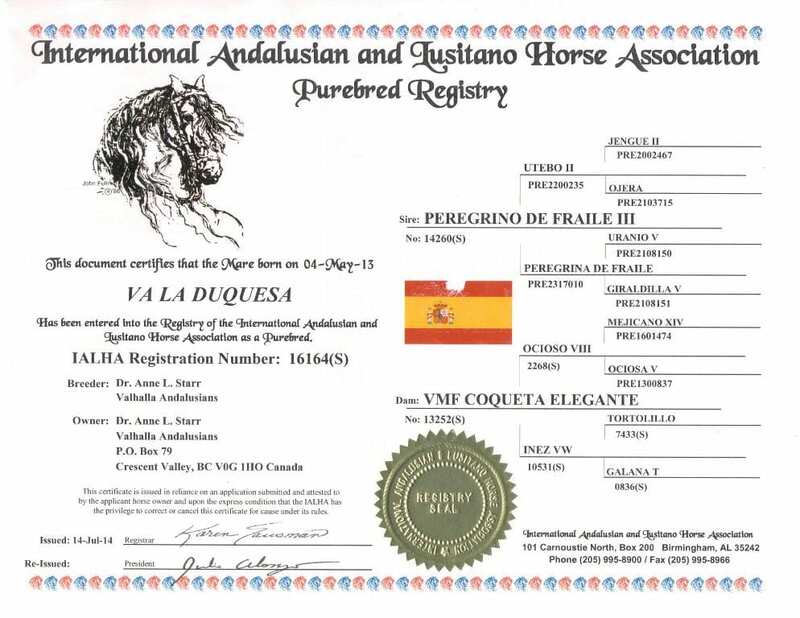 VA La Duquesa was the 2014 Canadian National Champion filly, 1 year old and the Gold Medal Movement winner. She was the 2015 National Champion 2 year old Filly and the 2016 National Champion Jr Mare and Gold Medal Movement Winner. To top it all off, she was the 2016 and the 2017 Supreme Halter Champion for the whole show !!! So proud of “Boo” (her barn name as she has been snow white since 3 months old). Duquesa has been started under saddle with our dressage trainer Kaylyn Steinhauer and has 4 months under cinch. She has a very balanced walk, trot and canter with nice suspension, elevation and expressiveness. She is very smart, quick to learn and always wanting to please. SOLD – Centurion is a beautiful 2013 PRE grey Andalusian colt. 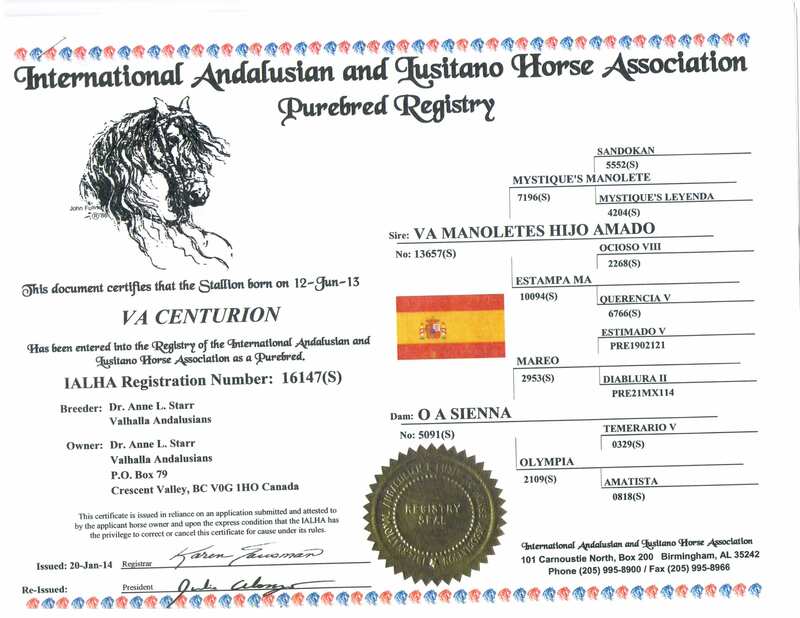 His dam is our mare OA Sienna and his sire is our US national champion stallion VA Manolete’s Hijo Amado. This lovely colt is everything that we had hoped for: friendly, great conformation and outstanding movement. His dam Sienna continues to outdo herself in the movement department giving us yet another colt born for dressage. A great big Congratulations to the Nachtigal family of Chilliwack, BC for the purchase of VA Centurion, the 2014 PAALH Auction colt. We wish you the very best on your first Andalusian. The Love Affair has begun ! 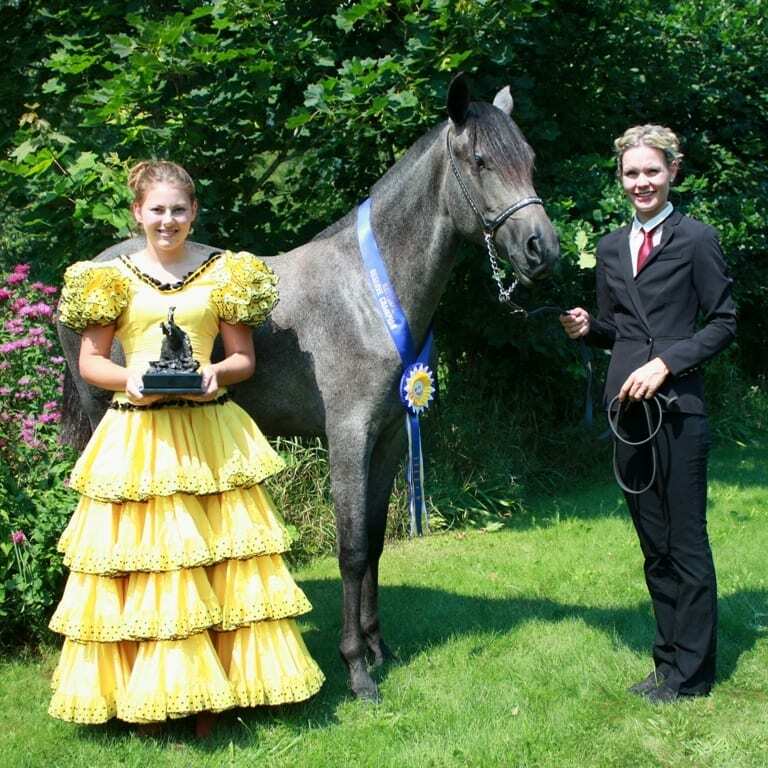 SOLD – Katerina is a very elegant 2013 PRE grey Andalusian filly. 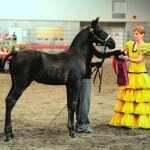 Her dam is our US and Canadian national champion mare Estampa MA. Her sire is Kripton-Seni II, one of the most famous multi-national Champion sires in all of the US. Kripton was inducted into the USEF Hall of fame in 2013 and is widely known to the general public for being the Andalusian stallion chosen to be the Breyer Horse model. Katerina seems to have it all: beauty, presence, intelligence and a very kind disposition. 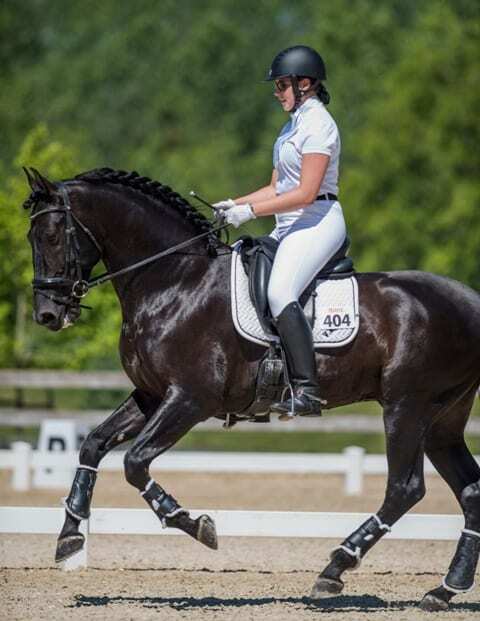 We look forward to the 2014 show season as she is sure to be a show stopper. VA Katerina has been sold and has joined her new partner, Julie Corkett in Sundridge, Ontario. Congratulations Julie, may you have many amazing rides on your new BFF.